In addition to their North Texas ties and current jobs as faculty in the Washington, D.C., area, the three musicians have another thing in common — military band experience. 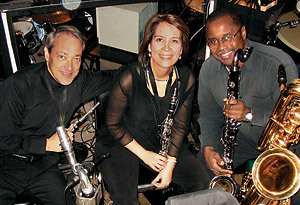 Eckert retired in 2004 from a 20-year career as lead alto saxophonist/woodwind specialist and music director with the Air Force Band’s Airmen of Note jazz ensemble. Levin played in the Navy Band from 1986 to 1990, and Young was a member of the Navy Band’s Commodores jazz ensemble from 1981 to 1983. The new North Texas Exes web site at www.ntexes.org now includes three levels of access — features for the general public, for North Texas alumni and for Exes members only. Anyone who visits the site has access to photo albums, web postcards, news clips and the events calendar. In addition to the access granted to the general public, North Texas alumni are able to post class notes and create a personal profile for the site so others can learn more about them. Because members of the North Texas Exes have full access to the site, they are also able to exchange business cards, read class notes and use the searchable alumni database to find old friends and classmates. Members have the option to add photo albums to their profiles to keep up to date with North Texas friends. Go to www.ntexes.org to register. To become a member and gain unrestricted access to the site, log on or call (940) 565-2834. Central Texas and Southern Dallas County chapters of the NT Exes have recently been established, joining the previously established Austin Area, Bi-Stone, Dallas County, Denton County, Gulf Coast and Tarrant County chapters. Through these chapters, the NT Exes are raising scholarship funds and bringing recognition to UNT. If you’re interested in creating a chapter or becoming active in your area chapter, contact Barbara Sanders at (940) 565-3162 or bsanders@unt.edu for more information. For information about becoming a member of the North Texas Exes, visit www.ntexes.org or call (940) 565-2834.